Read skier and snowboarder-submitted reviews on Mt. Hood Skibowl that rank the ski resort and mountain town on a scale of one to five stars for attributes such as terrain, nightlife and family friendliness. See how Mt. Hood Skibowl stacks up in the reviews, on and off the slopes, from skiing and family activities to the après scene. Read up on pros, cons and other comments in reviews left by fellow skiers and riders. Don't forget to submit your own Mt. Hood Skibowl review! Scroll to the bottom of this page to let other travelers know about your skiing and resort experience. For more destination information, click Add to Compare to see a side-by-side comparison of Mt. Hood Skibowl vs. other ski resorts (up to 10 total). While it may not appear to be a "big" mountain, this place skis much bigger than you would think. Sure the lifts are slow, but once you are in the upper bowl you can make pretty fast laps on some very enjoyable terrain. Trips into the Outback take a bit longer with a boot pack and going all the way to the base area, but it is a quality vs. quantity thing. For anyone saying that you could get "bored" either doesn't ski that well or hasn't explored enough. That is fine though. Keep on driving to Meadows. The night skiing is superb. Great terrain at night with all of the upper bowl being lit. I do wish they kept the Cascade chair running at night. 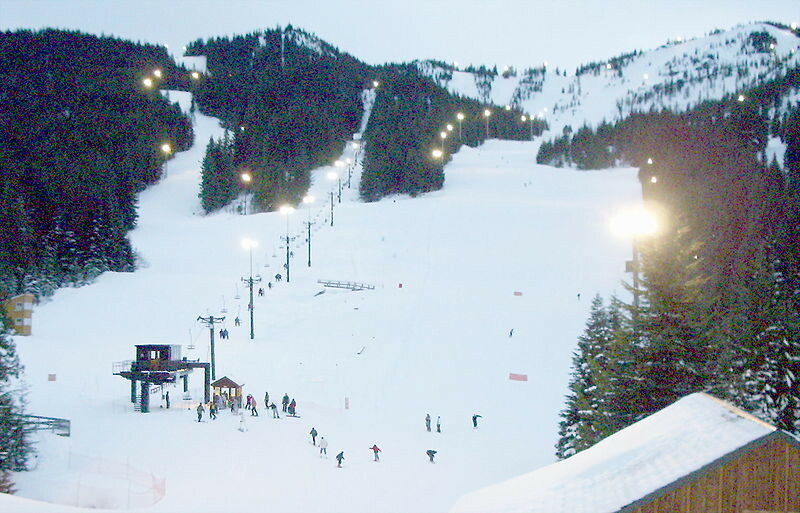 The only downsides of skibowl are the slow lifts (lower bowl) and elevation. If the line picks-up, you can stand around waiting for a bit. But that happens everywhere. The elevation is another concern. Many times I have had to go up to Meadows or Tline due to rain. In summary, if you couldn't care less about apres, this is a great mountain.